Stories of the unexpected: Until further notice Made for July's Mag competition. Storyline: Two middle aged guys set out to rob a bank due to their financial circumstances. 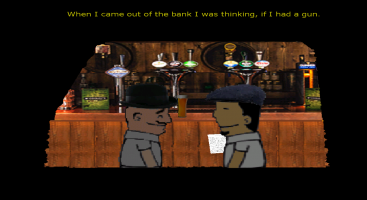 Can they infiltrate the bank, find the safe, open the safe, grab the money and end their money troubles? George Ponsonby: "Bert..." George: Ponsonby "...haven't even told this to my wife." George Ponsonby: "Ponsonby Metals is on the verge of bankruptcy." Controls: Custom 2 Click mouse: left Click Interact / Right Click Look at. Tab or GUI Button to open up tools. Misc: Clock display. Frequently updated. Feedback encouraged. I enjoyed the subtle humour and the ending was brilliant. As for the puzzles, I think I would have preferred a little less guidance but the mini-game was a nice addition. You've done a great job in a short timeframe once again. I always enjoy the dialogues between your characters. And there's a good diversity of puzzles this time. Once again a great effort under time constraints. Entertaining storyline, good characters well rendered, good animation, humourous twist at the end. A fun game to play!